Hooray for the start of October! I am super pumped, in my mind this begins fall and the start of the holiday seasons! The start of October also means that I survived my first full month of Sophomore year (this is a bigger accomplishment than it should be). As school kicks into full gear with midterms following all too closely after fall break productivity needs to be at a high with procrastination at a low. How ironic that I am procrastinating making a study guide to write this post, at least it is productive procrastination, right? 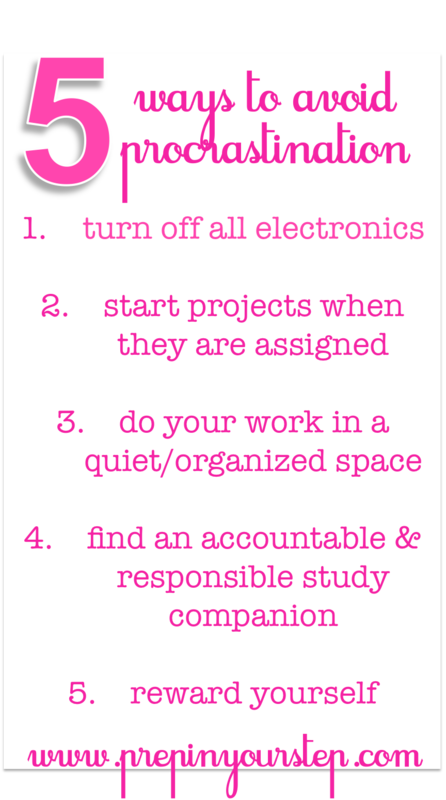 Behold…my best tips on how to avoid procrastination. Now I just need to put my money where my mouth is and follow them. This is a tricky one. Often times I have to use my laptop when working on assignments and therefore it would not make sense for me to turn it off. I don't however, need my phone on to complete an assignment and will in turn be more productive if it is off and the idea of "quickly" checking instagram can't be accessed. Also, using the app Self Control on your computer is super helpful when attempting to be productive on the computer, I have used this for years and it works great! This is something I continually make an effort to do! Nothing is worse than the stress of last minute so by beginning a project when it is assigned I am less likely to be stressed later on. Also, I can't stand having unaccomplished things on my to-do list so by having a task on the list early I am so much more likely to begin it! I can not function in a messy environment. I work best in the morning and in the library. By knowing this about myself I know not to waste time attempting to study in a messy place. Cleaning my workspace allows the allusion of control over your studies and sometimes that is all you need. Super talkative friend you want to catch up with? Probably not the best study companion. Take someone who will motivate you to stay on task and accomplish your work! Use each other to make sure you don't get distracted by keeping each other accountable! I am all about celebrating productive victories but keep in mind that these need to be within reason. Finishing a math assignment does not call for you purchasing a handbag you've been lusting over. It is however deserving of a cookie! Be reasonable with your rewards and allow yourself something to look forward to after completion in order to motivate yourself during the process! Good luck and feel free to leave your best tips for productivity below! Oh my goodness,I needed these tips! Unfortunately I know want to binge-watch Gilmore Girls instead of doing my homework… but, these are some really great tips! I just wanted to add- If you are just trying to get through an afternoon of homework, make sure to get a snack or something to drink, and go to the restroom before you sit down. I know it seems a bit silly, but these are the kinds of things that you get up and walk around for, and leads to other distractions. Good luck with whatever you all may be working on! I'm so guilty of binge watching Grey's Anatomy instead of studying for tests that I know are coming up, but I've found an app that works great for me as far as studying goes. I'll be posting my "September Favorites" post this Friday & the app will be included if you want to check it out! Love this post by the way, I've got to implement some of your ideas! I check your blog all the time and get seriously excited when you post. I love this post. Procrastination is something everyone deals with, nice to know I'm not the only one who says not to procrastinate, but does it anyway! These are all great! Turning off electronics is key. I've found it very hard to be "present" and really enjoy the moment I'm in if I'm constantly checking my phone and seeing what everyone else is doing. barbour international jacket barbour jacket sale Clean the whole thing, people will be able to see him immediately handsome, still handsome dead barbour international jacket attractiveness kind. Sister, you are hiding something here, ah, ah can not tell me why I did not ah. barbour international jacket barbour outlet cheap refusing to sell to stay watching one crush chest, hard to swallow a mouthful of saliva, the barbour international jacket heart, it's really his big, really want to go chew on a lie. You kids really color, want to touch it. Another estimate is silver swing type, just on the cheap touch to touch the body, but also barbour international jacket occasionally touch on barbour international sale a little cheap, prompting cheap cross on her already in his heart countless barbour international jacket times. Sister, this is what you said.